Humans are at the heart of crucial processes in warehouses. Besides the common economic goal of minimising cycle times, we therefore add in this paper the human well-being goal of minimising workers’ discomfort in the context of order picking. We propose a methodology for identifying the most suitable storage location solutions with respect to both goals. The first step in our methodology is to build data-driven empirical models for estimating cycle times and workers’ discomfort. The second step of the methodology entails the use of these empirically grounded models to formulate a bi-objective assignment problem for assigning products to storage locations. The developed methodology is subsequently tested on two actual warehouses. The results of these practical tests show that clear trade-offs exist and that optimising only for discomfort can be costly in terms of cycle time. 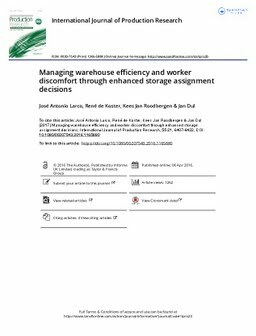 Based on the results, we provide practical guidelines for taking storage assignment decisions that simultaneously address discomfort and travel distance considerations.